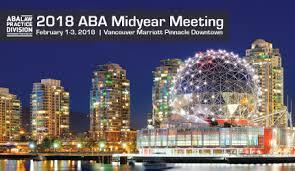 If you are attending the ABA Midyear Meeting in Vancouver the first weekend in February, reside in the B.C. area or simply are looking to escape to Canada (as so many U.S. citizens and non-citizens now are), be sure to attend this free CLE program, Fishing for Prospects – Ethical Limitations Can Create Muddy Waters in Catching New Clients on Saturday, February 3, 2018 from 2:30 p.m. to 3:30 p.m. PST at the Vancouver Marriott Pinnacle Downtown. This ABA CLE, co-sponsored by the Law Practice Division and the Young Lawyers Division focuses on ethical strategies for business development and relationship building. We will cover ethic rules and related pitfalls when soliciting new clients and advertising your practice. The Rules of Professional Conduct, various US Supreme Court cases and numerous state bar ethics opinions can create an often-unseen myriad of issues when soliciting new clients. 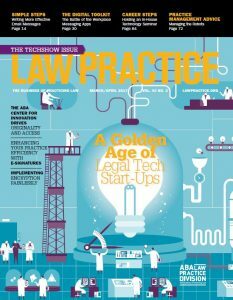 In a world where every law firm is (or says) they are “full-service,” comes this issue of Law Practice Today dedicated to niche practice marketing. 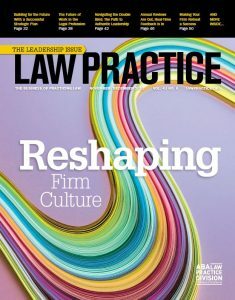 Depending on your firm, practice and related industries, a niche can be many things to many people—with no real right or wrong answers…so begins the intro to my article on The Pros and Cons of Niche Practice Marketing in the November 2017 edition of the ABA’s Law Practice Today (LPT) webzine. 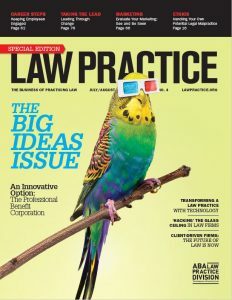 As a member of LPT’s Board of Editors, past Editor-In-Chief and past chair of the ABA Law Practice Division, I’ve long-enjoyed seeing the growth of the law practice webzine—which is delivered in the inbox of every ABA member (that opts into e-mail) and numerous syndicated bar association partners throughout the country, giving it the largest circulation of any online law practice resource in the U.S. I had the pleasure of serving as issue editor for the niche practice issue, with my colleagues Editor-In-Chief Andrea Malone of White & Williams in Philadelphia and Associate Editor Amy Drushal at Trenam Law in Tampa, Florida. It is unusual for me to contribute two pieces to an issue, but I had to add a sidebar on How Niche Marketing Helped Me Escape an Arizona Traffic Jam as well. It goes hand-in-hand with an interesting article on When Photo Radar is Worse Than DUI by my (now) favorite firm in Scottsdale, Arizona. You’ll learn about the niche at R&R Law Group, along with how solid marketing efforts brought this educated consumer (that would be me) to their practice for counsel. Spoiler alert—they were 100% successful in their representation of the client. In order to get your ethics credit while attending my annual PBI marketing ethics program, you will need to watch me “live…on tape…from Philadelphia” (Larry Sanders Show reference) on December 19th in Pittsburgh or December 21st in Philadelphia. HOWEVER, if you’re interested in the subject matter, you are invited to attend the free live taping of that program (without the CLE credit; written materials will be provided via e-mail in PDF form), at The CLE Conference Center in the Wanamaker Building on Tuesday, November 28th from 10:30 am to 11:30 am. If you are fascinated by the topic and enjoyed my recent ABA Law Practice Magazine column, Revisiting Lawyer Ratings and Rankings, you’ll learn a lot in this one hour program. Thank you to PBI for allowing me to extend an invite to the local lawyer and law marketing communities to attend the taping. When I wrote my marketing column for the November/December 2017 issue of the ABA’s Law Practice Magazine, Revisiting Lawyer Ratings and Rankings, I lamented how dealing with the R&R industry felt like it took up time during every single working day. So it seemed somewhat ironic that the magazine arrived in my mailbox on the same day that I penned more than a half dozen press releases for law firms announcing their results from the 2018 U.S. News/Best Lawyers’ “Best Law Firms” honors. Now it happens that as ratings go, I have respect for the good people at Best Lawyers and U.S. News. They are always easy to work with—and unlike some others named in the column—they avoid the used car sales approach with my law firm clients. They lend a guiding hand with the process, regardless of how much the firm might be spending on the “award” product line. Perhaps your experiences have varied. We all have very subjective feelings to who and what in this business is credible. You may find the ones that give you the highest honors to certainly be the most legitimate! What entities are referenced by name in this month’s column? 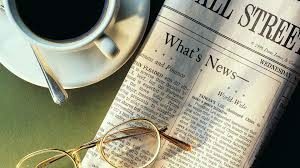 In order of appearance: Best Lawyers and U.S. News, Chambers USA, Avvo, American Lawyer Media (ALM), Lawyers of Distinction, Expertise.com, Yelp, Super Lawyers, Rising Stars and Martindale. WSJ: Time to Rank the Rankers of Lawyers? You have NO IDEA how much I nodded my head when picking up this morning’s Wall Street Journal and seeing reporter Sara Randazzo’s article on Time to Rank the Rankers of Lawyers? It has seemingly been a huge part of my work days over the past few weeks. Unfortunately, you will have to wait by your mailbox for the November/December 2017 issue of the ABA’s Law Practice Magazine to see the marketing column I authored for it a few weeks back entitled Revisiting Lawyer Ratings and Rankings, which is a follow-up to my 2014 column, The Impact of the Three R’s: Ratings, Rankings and Reviews—which still draws e-mails and phone calls. In the column, I highlight past and present issues with an industry that is still burgeoning and remains largely unregulated (despite generally failed attempts by state bars and even the Better Business Bureau) to reign them in. Ah, the ancient art of face-to-face. Ironically, it is still perhaps the greatest business development tool known to man (and woman). Yet, as we seemingly get busier and busier each day, face time has been replaced by FaceTime and Facebook and all other sorts of live-people-avoidance tools aided by a variety of technologies. This is not to say that those all-important “touches” that remind people of you, your law firm, your brand, your expertise—delivered by e-mail, newsletter, social media, pure advertising, online search or secondary public and media relations efforts are not effective. A touch is a touch. But actually seeing someone in the flesh in their office, at a meeting, over lunch or some other public space is still the most powerful and likely way to generate a new referral or matter. 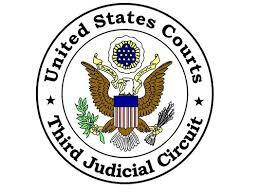 If you ar e a Judge or attorney fascinated (or at least feeling like you need to know this stuff) by the world of social media, consider attending the 2017 Third Circuit Judicial Conference on April 19, 2017 at the Lancaster Marriott at Penn Square in Lancaster, Pennsylvania. I will be participating in “Twitter in the Court: Social Media Issues for Judges, Lawyers” from 4 pm to 5:30 pm along with fellow panelists Cynthia L. Dahl, Director of Detkin Intellectual Property and Technology Legal Clinic and a Practice Associate Professor, University of Pennsylvania Law School; and Kathryn E. Deal, Partner, Drinker Biddle & Reath LLP. Our program is moderated by the Honorable Lawrence F. Stengel, United States District Judge, Eastern District of Pennsylvania. The panel will cover a wide range of topics in the vast realm of social media, from a brief history and introduction to the major social media channels (Facebook, Twitter, LinkedIn, Snapchat) to the boatload of ethical issues that arise and the many ways social media has impacted matters in the courtroom. Diversity as a business development tool cuts both ways. For those law firms that lack it, there is often frustration in knowing there are matters and clients that they will lose. For those that have it, there are endless opportunities to be rewarded. It was ironic that the March/April 2017 issue of the ABA’s Law Practice Magazine arrived the same week that I was working on another ABA responsibility—the March 1st implementation of the ABA’s new CLE diversity policy. As chair of the Standing Committee on Continuing Legal Education (SCOCLE), I have had the privilege of being involved in the many years where this policy was discussed, and ultimately adopted. Now I have the opportunity to oversee the implementation of a policy—that quite simply—requires an ABA program to meet a certain diversity threshold among the faculty, or not be accredited by the association. It is not unlike the requirement of many corporate legal departments that will dole out work to diverse lawyers. What do for-profit and nonprofit legal organizations stand to gain from publishing free or low-cost educational resources? 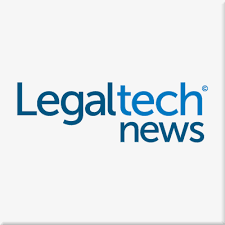 Investment in a public good and expertise, to start, writes Law Technology News reporter Gabrielle Orum Hernández in the November 2016 edition. In Online Legal Resources Straddle the Line between Public Good and Client Generation, Hernandez asked me about my experiences with the subject matter. I talked about a Hart-Scott-Rodino database I worked on with Morgan Lewis in the 90s—an early adopter for sure. I mentioned how I often use Tom Spahn’s legal ethics opinion summaries database at McGuireWoods—a great free online resource. I pointed out that many online resources that were once considered valuable content—links libraries, FAQs, online forms and brochures—were now often outdated, replaced by short and sweet videos, blog posts and on-demand webinars, podcasts and accredited (free) online continuing legal education (CLE). But perhaps my most profound comment was sending her to my friend Greg Siskind, the king of online content development for the last 22 years or so at Visalaw.com. Greg’s start as a 26-year-old lawyer in 1994 trying to open up his own shop as a solo immigration attorney is the ultimate online rags-to-riches story—not as an immigrant (he’s from Nashville), but recognizing way back when that content development was the key…way, way before the term “content marketing” came into vogue. 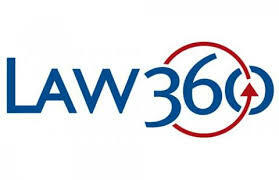 In the September 13, 2016 edition of Law360, reporter Kevin Penton writes on 3 Secrets to Retaining Millennial Attorneys. He interviewed me, along with Michael Di Gennero, a senior director with Lateral Link, a recruiting agency; and Danielle Goldstone, a senior consultant with Laurence Simons, a legal and compliance recruiting firm.